Baroud is founder of PalestineChronicle.com, which features a steady stream of articles on the realities of Israeli politics, like the recent “Palestinian Teens Detail Their Torture at the Hands of Israeli Authorities.” Baroud is a veteran journalist and former producer for Al Jazeera. He is also author of several books including Searching Jenin, The Second Palestinian Intifada and, his latest, My Father Was a Freedom Fighter: Gaza’s Untold Story. He said today: “Within days of U.S. President Donald Trump being sworn in, the Israeli government announced the approval of around 2,500 new housing units. 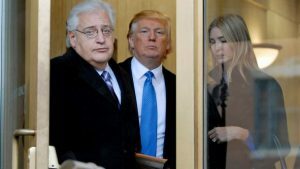 “Within the first two weeks of Trump’s presidency, the number of new housing units, all to be built illegally on Palestinian land, was raised to 5,500, including the first brand new government-sanctioned colony in years. “In response, Israeli Prime Minister Benjamin Netanyahu tweeted: ‘We are building — and we will continue to build’ — a statement which clearly expresses Israel’s blatant disregard for and violation of international law. What is clear is Israel’s determination to continue its ravenous expansion of illegal colonies, which is unprecedented in the least eight years. “It is true that the colony-building activities accelerated after the signing of the so-called Oslo Peace Accord, but in recent years Israel realized that every decision to approve constructing more units in illegal colonies came at the price of international criticism and condemnation. “Now that Trump is in power, Israel, controlled by right-wing, ultra-nationalist and religious zealots is rapidly moving to further ratify a new, irreversible political reality. “The total number of Jewish colonists now stands at 750,000, nearly three times the number of colonists in 1992 (shortly before the Oslo Accord was signed). “These numbers have all accompanied the continuous ethnic cleansing of Palestinians from their land and homes, and the revocation of residency permits for Palestinians in the occupied Jerusalem area. “Thus, the recently announced massive expansion of Jewish colonies will have not only considerable political consequences, but humanitarian ones as well.